Water is the primary ingredient in virtually all beverages, but process water can create as many problems as it solves. Using less water is the solution — except when it’s not. Soft drink bottlers and other beverage companies straddle the arid and saturated worlds: Their finished goods are water-based, but (ideally) they process in a dry environment. The dryness of the environment can be disputed. Walk through any fluid milk plant or brewery, and the slip-and-fall dangers from water on the floor are apparent. Ideally, however, the environment is closer to a bakery than a poultry plant. Water is necessary for microbial life, and footwear baths can become breeding grounds for pathogenic bacteria if not properly maintained. Rather than flirt with having plant personnel tracking in harmful microbes on their shoes, beverage plants are moving away from water-based baths and toward quaternary ammonium compounds and other solids in doorways. Conversely, hand sanitation often relies on antibacterial gels or alcohol rinses in beverage facilities, and the efficacy of those sanitizers is being questioned. Just as equipment and food-contact surfaces must be cleaned before they can be sanitized, people’s hands must be free of residual soil before they can be sanitized. In the view of the Centers for Disease Control and Prevention (CDC), soap and water is a best practice for handwashing in both food and beverage production facilities. Water conservation is a tough sell, as Nalco chemical company and Johnson Diversey discovered when they partnered on a water-monitoring service, first in Europe in 2000 and then in North America a few years later. Both companies were acquired in 2011, Nalco by Ecolab and the Diversey organization by Sealed Air Corp. Now known as the food care division of Sealed Air, Racine, Wis.-based Diversey continues to offer a water optimization program for the beverage industry, positioned as a way to reduce total cost of operation (TCO) rather than conservation, according to Mike Lammers, senior beverage and brewing sector specialist. At $6 per 1,000 gallons, the average cost of water in the US is “the cheapest in the world,” Lammers points out, undermining conservation efforts in all but the most drought-plagued areas of the country. TCO, on the other hand, includes the cost of heating water, chemical additions, wastewater handling and, perhaps most importantly, the time saved from optimized cleaning and sanitation. Because processes occur in pipes and enclosed vessels, clean in place (CIP) systems dominate the beverage world. Those systems “are huge water consumers, and most of them are not optimized,” he adds. The vast majority of microbial issues in these facilities relate to the filler valves, and the older fillers that populate most of the plants were not engineered for cleanability. To compensate, extended CIP cycles with 185° F water is the typical protocol. Product proliferation, however, undermines the “cook it off” tactic. Instead of 72-hour production runs, six hours is the new normal, and a 2 ½ hour CIP cycle to sterilize the filler valves is a throughput killer. Conductivity sensors and other measures of the strength of detergents and sanitizers are helping some processors reduce the CIP cycle to one hour. A beverage plant with three lines typically will realize savings of $50,000-$75,000 in annual water costs from CIP optimization. The energy savings from reduced thermal treatment of that water reaches to the mid- to high six-figure range. The increase in production time from shorter CIP cycles “is the holy grail,” says Lammers, and that makes plant operators see the TCO light. If less water for equipment cleaning is the goal, more water for personal hygiene is the direction in beverage processing. According to Michele Colbert, vice president of sales & marketing at Meritech, Golden, Colo, food safety auditors are chastising beverage plants that rely exclusively on waterless sanitizers and insisting they make soap and water available to workers to meet the standards under Global Food Safety Initiative (GFSI) programs such as SQF and BRC. “The beverage industry in the past has been getting by with gel-type sanitizers, which are not acceptable to third-party auditors,” Colbert maintains. 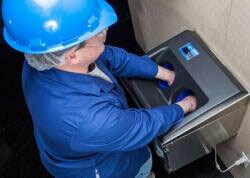 The plants are being required to install sinks or automated handwashing systems such as Meritech’s if they hope to be certified under GFSI programs. “Instant sanitizers are everywhere, but they create a false sense that they remove all debris and kill everything, when they don’t.”…..